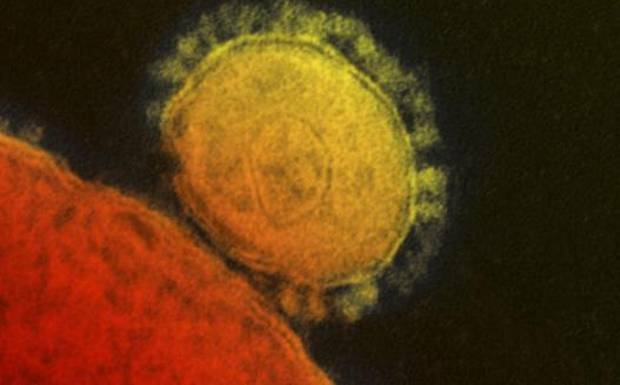 Bangladesh has confirmed the first case of the deadly Middle East Respiratory Syndrome coronavirus (MERS) after a man returned from the US via Abu Dhabi was found afflicted with it. Mahmudur Rahman, director of Institute of Epidemiology, Disease Control & Research (IEDCR), said Sunday that the man was recuperating in a hospital, bdnews24.com reported. “We have notified it to the WHO,” he said. Coronaviruses are a large family of viruses that cause a range of illnesses in humans, from the common cold to the Severe Acute Respiratory Syndrome (SARS). The virus was first identified in 2012 in Saudi Arabia and has remained a global concern since then. It has spread to 22 countries, including Bangladesh, from the Middle East. So far, the WHO recorded 699 cases of MERS with a mortality rate of 30 percent. 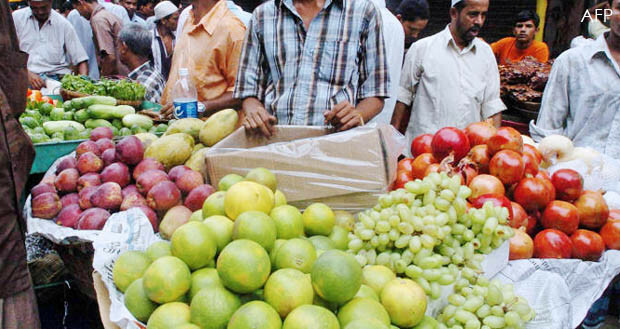 Bangladeshi police are to set up check posts at the main entry points to the capital Dhaka to prevent the import of fruits which have been sprayed with alarming levels of a deadly chemical, officers said on Monday. The Dhaka Metropolitan Police (DMP) unveiled the move after it found high levels of formalin, an illegal chemical which is sometimes used as a preservative and disinfectant, in almost all the fruits it checked in Dhaka’s markets, DMP spokesman Masudur Rahman said. “The check posts will be set up from June 11 at eight entry points of the city. Armed with formalin detection kits, our officers and magistrates will check every lorry carrying fruits to the capital,” he said. Anyone found to have carried formalin-laced fruits could be jailed for up to two years or fined up to $2,531 (200,000 taka), he said. A huge public outcry over formalin-mixed fruits prompted the “unprecedented” police move, as repeated tests by laboratories and food inspectors have found fruits sold in Bangladesh contain an “alarming level of formalin” in an effort to extend their shelf life. On Sunday, Dhaka’s police chief Benazir Ahmed equated the situation to an attempt at slow poison mass killing and pleaded with residents “not to get involved with buying, selling or consuming formalin contaminated fruits”. His comments echoed those of civic and doctors’ groups who said Bangladesh was on the verge of a massive health crisis as reflected in a rising number of kidney and cancer patients, with toxic chemical-mixed food items playing a key role. Rahman said fruits could naturally contain 0.03-0.15 ppm (part per million) level of formalin, but during inspection in Dhaka’s markets police found the level between 3.5 ppm to 46 ppm. “It’s a extremely dangerous situation. This level of formalin mixed in fruits can kill a lot of people,” said Rahman. Police concern was also sparked by a two-year-long test by a government laboratory which found an unprecedented level of adulteration of other food items. 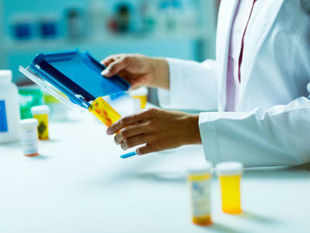 The Institute of Public Health has conducted the test on 10,289 samples of 50 items and found that 47 items were adulterated, according to mass-circulated The Daily Star. The items include edible oil, spices, sweets, milk products, lentils, pulses, juices, pickles, biscuits, jellies, dried fish, flours and tea leaves. 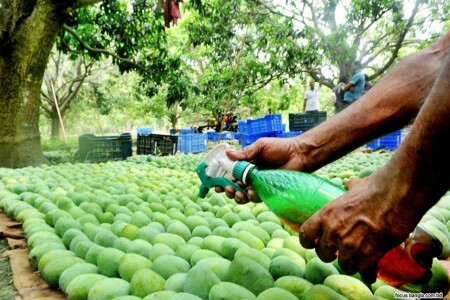 Bangladeshi police are to set up check posts at the main entry points to the capital Dhaka to prevent the import of fruits which have been sprayed with alarming levels of a deadly chemical, officers said Monday. “The check posts will be set up from June 11 at eight entry points of the city. Armed with formalin detection kits, our officers and magistrates will check every lorry carrying fruits to the capital,” he said. Anyone found to have carried formalin-laced fruits could be jailed for up to two years or fined up to 200,000 taka ($2,531), he said. Rahman said fruits could naturally contain 0.03-0.15 ppm (part per million) level of formalin, but during inspection in Dhaka’s markets police found the level between 3.5 ppm to 46 ppm. “It’s a extremely dangerous situation. This level of formalin mixed in fruits can kill a lot of people,” said Rahman. Police concern was also partly sparked by a two-year-long test by a government health laboratory which found an unprecedented level of adulteration of other food items. The Institute of Public Health (IPH) has conducted the test on 10,289 samples of 50 items and found that 47 items were adulterated, according to mass-circulated The Daily Star. The items include edible oil, spices, sweets, milk products, lentils, pulses, juices, pickles, biscuits, jellies, dried fish, flours and tea leaves. Excessive intake of sodium is resulting in serious health problems like high blood pressure, as people have been found to be taking more than double the required amount of sodium through salt. As many as 12 million people suffer from high blood pressure in Bangladesh which is the main cause of heart attacks, brain strokes and kidney diseases, according to a survey conducted by National Heart Foundation Hospital and Research Institute (NHFHRI). According to the World Health Organisation (WHO), an adult man or woman should take only five grams of salt every day. The NHFHRI survey, however, found that in urban areas, people take 10.3 grams of salt a day, with males taking 11 grams and females 9.3 grams. Findings of the survey was disclosed at a seminar organised by the NHFHRI at the institute’s auditorium in the capital yesterday. The seminar was titled “World salt awareness week-2014” while Dr Sohel Reza Chowdhury, Professor of the Department of Epidemiology and Research at NHFHRI, presented the keynote paper. The keynote paper said heart attacks and strokes are the leading causes of death globally. Each year, 1.73 crore people die of these diseases while more than 80% of the deaths occur in lower and middle income countries. In Bangladesh, the prevalence of non-communicable disease (NCD) is on the rise while heart attacks and strokes are the most common among the NCDs. Health minister Mohammad Nasim spoke as the chief guest at the seminar. He said in order to ensure proper investigation into the incidents of deaths due to negligence of doctors, the government was planning to introduce new rules for Bangladesh Medical and Dental Council (BMDC). “BMDC will be given the power to cancel the registration of a doctor if the allegation of negligence against him is proved. The health ministry will sit with renowned and senior health professionals to discuss the issue,” he said. The minister urged the authorities of big hospitals to provide the poor patients with special facilities. India launched its first indigenously developed device for screening and early detection of cervical cancer, which kills over 74,000 women in the country every year. Launching the low-cost “AV-Magnivisualiser” device developed by Indian Council of Medical Research (ICMR), Union Minister of Health and Family Welfare Ghulam Nabi Azad said it will help in early detection of cervical cancer among adolescent girls and women, thus helping in save many lives. Designed and developed at Institute of Cytology and Preventive Oncology ( ICPO), Noida, working under ICMR, the device will cost about Rs 10,000 and is much lower as compared to the cervical cytology method used at present in medical colleges, the equipment of which costs over Rs eight lakh. “I am extremely happy and I congratulate the scientists involved in the cutting-edge level. I hope the cost-effective device will be available in the market in the next eight months to help ensure .. The Minister said with this device it will be easy to screen and detect cervical cancer in its early stages, thus making treatment more effective. “We will also ensure proper training of nurses and manpower for using the device in the coming months,” he said, adding that screening for cervical cancer is available only in regional cancer institutes and medical colleges at present. He said the equipment presently being used is expensive, as a result of which not many medical coll ..